The market had a volatile day today and ended up closing substantially down from yesterday. I assume the 1988 level will be challenged again (perhaps in pre-market?) and if that level doesn't hold, a test of the 200 DMA at 1975 is imminent. However, the waves remain choppy and unless we see a clean impulse to the downside, the market will stage a strong counter rally and break out of the Descending Broadening Triangle in place. On the bullish side, oil's rally today is the best in almost 3 years (too bad my stops kicked in 2 days ago!) and another close over $46 on Monday will turn its Trend Average bullish, something that has not happened since June 2014 when it was $105. If the rally starts in oil, I expect its 50 DMA to be tested and that technically will bring support to energy components in the stock market. Sellers could hang on to the negative sentiment due to volatility and the lower than projected GDP numbers for the 4th Quarter to continue the sell off. But let's not forget that under current monetary policy, slow growth just means low interest rates for a longer time which is a plus for assets. So while the trend is bearish and sellers have the momentum, bears have to really prove their case by closing the market under 1975 as the long term trend remains bullish (which btw will be 3 years old next week). The market put in another lower low as expected and it stopped right at the 1988 support I mentioned yesterday before rallying substantially. In an "ideal" bearish scenario, the market should have bounced into a W4 wave before resuming selling towards the 200 DMA. But that's not what happened as the bounce went into what should have been a W1 within a bearish nested structure, eliminating the bearish count and putting the bearish impulse into question. Still, the market has not tested the Trend Average yet and is far below the 50 DMA. So while the trend is bearish, the waves are giving us a mixed picture. Sellers need to breach the 1988 level in order to gain momentum, failure to do so will likely result in bulls gaining back control. Sellers took firm control today and they managed to turn the Trend Average convincingly to the bearish side, so I am assuming the current wave is part of the nested bearish count I mentioned on the post yesterday. I thought earnings from Apple would translate into euphoria as in the past, but not this time. So the next stop will be the double bottom support at 1998 and then the 200 DMA 1972. The long term trend continues to be bullish, so this might turn out to be just another correction. But if the market breaks below 1965-70, we could be looking at the start of a bigger correction. And considering the current bullish trend has been in place since February 2012, perhaps it is time to reset some of the long term oscillators. Trade below the 200 DMA is good for bears and for people with cash, so while I didn't get a chance to short to hedge as I had been hoping on a stronger rally, at least I can buy some stocks on sale. My oil position got stopped out, so I am thinking buying energy indirectly with an ETF from Russia's RSX or even Brazil's EWZ when the dust settles. The good thing about these ETF's is the high yield and the fact that I am buying businesses, which makes me feel much better as an investor. The one thing I don't like about buying oil directly though an instrument like USO is that there is no yield, it's pure speculation so it's not something one can hold on for too long. And in oil's case, it's really a matter of time before it shoots back up to $70-80. We just don't know how long it will take. 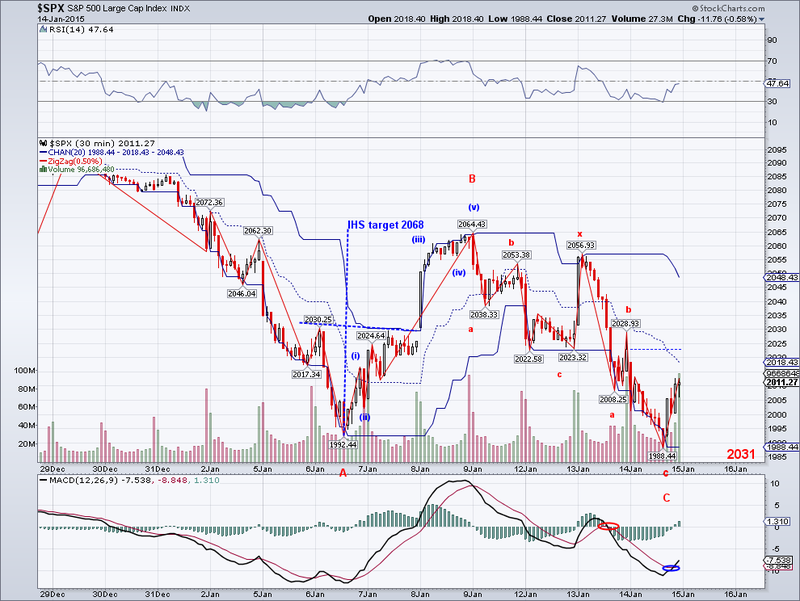 The micro count I was following failed with today's sell off earlier in the day. 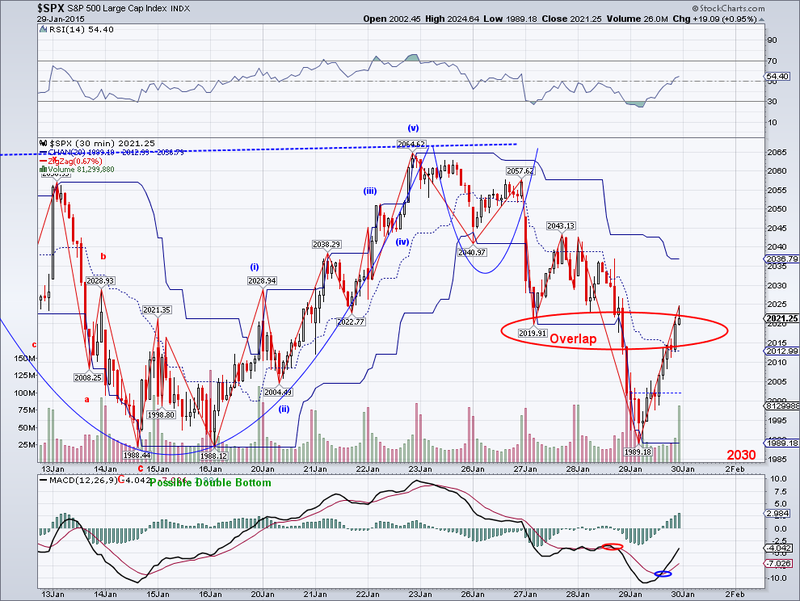 Still, the move from the most recent high of 2064 is an ABC move due to the overlapping waves. 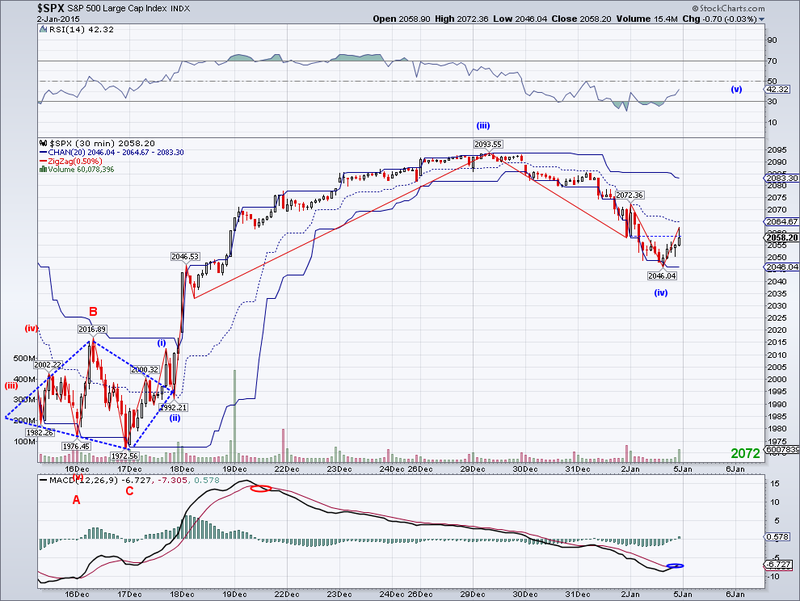 So this move could end up being a W2 correction given the impulse and then the zig zag. The market closed right below the Trend Average and clearly lost is 50 DMA. 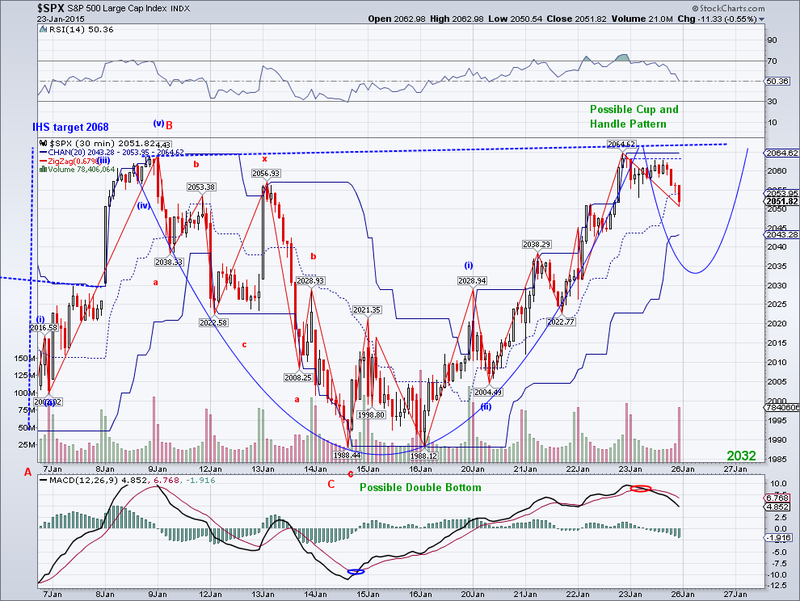 So if there is a bullish W3 coming, we should see bullish action as soon as tomorrow. Should the market fail to rally and go back down to today's low, then the count could turn into a nested bearish 1-2 but at this point I doubt it. The cause for the sell off was mainly the unexpected fall in the durables report and disappointing earnings earnings by CAT and in line reports at MSFT. However, Apple just announced and they exceeded the most optimistic expectations, so tomorrow we should see signs if the bulls are really going to rally to new highs. I am still holding to my oil, so maybe they'll start rallying too. The market tested the 2038 level I mentioned last week and we could see a 5th wave starting tomorrow to break the most recent high of 2064. 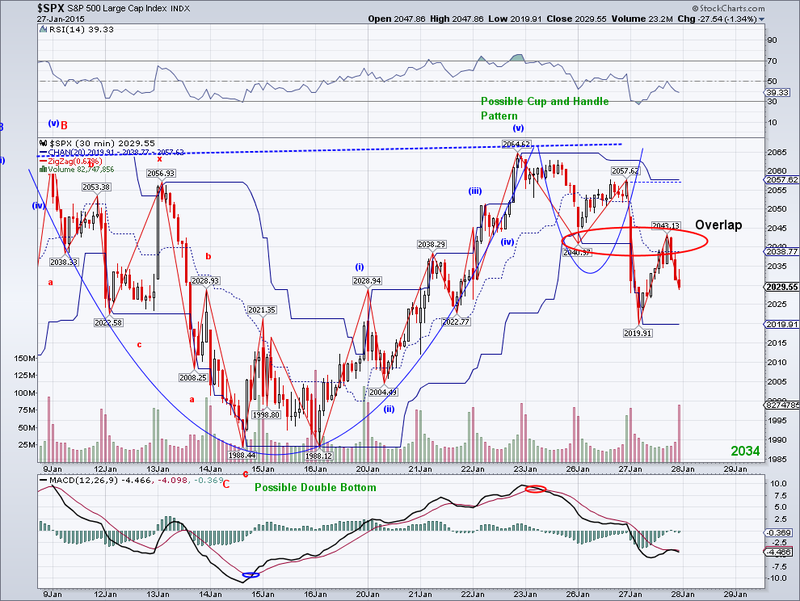 It's impossible to tell if the market will follow though on its Cup and Handle pattern but so far it's looking like it wants to. The outcome in Greece was the one event that sellers could take advantage of, but now that the news have been absorbed, there is nothing much sellers can sell into at the moment. And considering Apple is reporting earnings tomorrow (Apple should deliver strong results) along with other leading companies this week, bulls have the news advantage and that could ignite a strong rally to new all time highs. The market started a correction as expected and technically should at least test the 50 DMA before the next bullish leg. 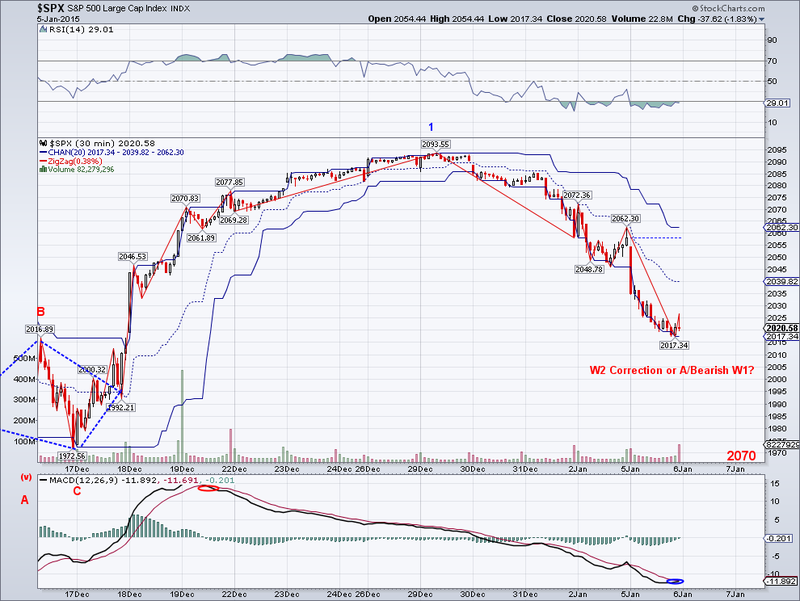 So far it looks like an ABC move for a W4 and we should find out early next week. 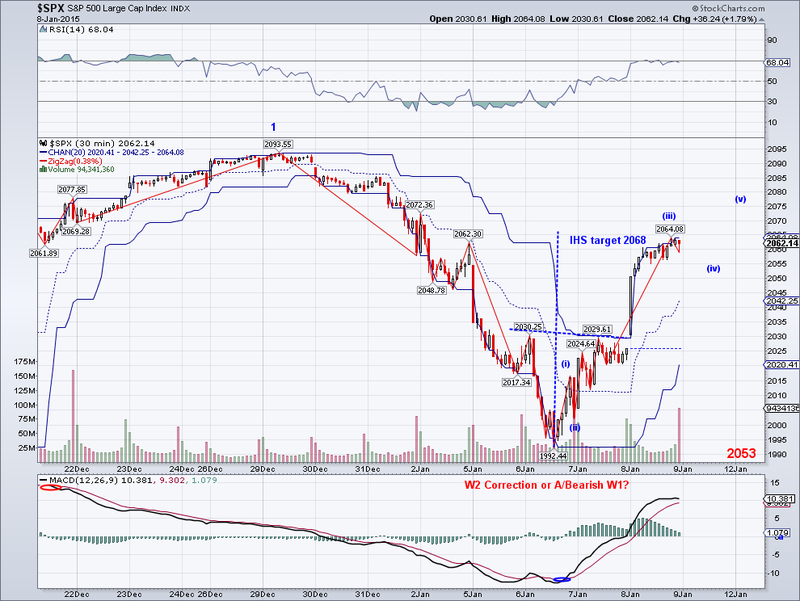 The ideal count for a C&H pattern would be a W2 for the handle, but we'll see if this micro count works. There are elections this weekend in Greece and this is perhaps the excuse to move the market on Monday. Some people worry about the implications of Greece leaving the EU, some say it won't be that big of a deal. Technically speaking, the Greek economy is relatively small at $260 billion. To put that into perspective, the US and China added about $1 trillion dollar each to their economies last year or 8 Greek economies in just 12 months. So if anything, it is more about the integrity of the EU as a union. I am holding my oil position, so I hope the market will respect the 44.20 bottom and rally to its 50 DMA. Whatever the case, I'm sure the supply side is making adjustments with prices this low. The market rallied today as expected after the European Central Bank announced QE, which in itself was not really a surprise. The price action confirms the double bottom at 1988 and officially turns the Trend Average to the bullish side. In addition, there is now cross over on the daily MACD, a close over the 50 DMA and a potential Cup and Handle pattern forming that targets 2,140. I expect a pullback to test the Trend Average or the 2038 support level to consolidate gains in the next session or two. But I wouldn't be surprised if the run continues given all the non-stop rallies in the last 3 years after significant bottoms. I ended up buying oil again given the clear stop level at last week's low. Perhaps it will finally start a counter rally to its 50 DMA. The market had a bearish opening but nonetheless ended up rallying the rest of the day. 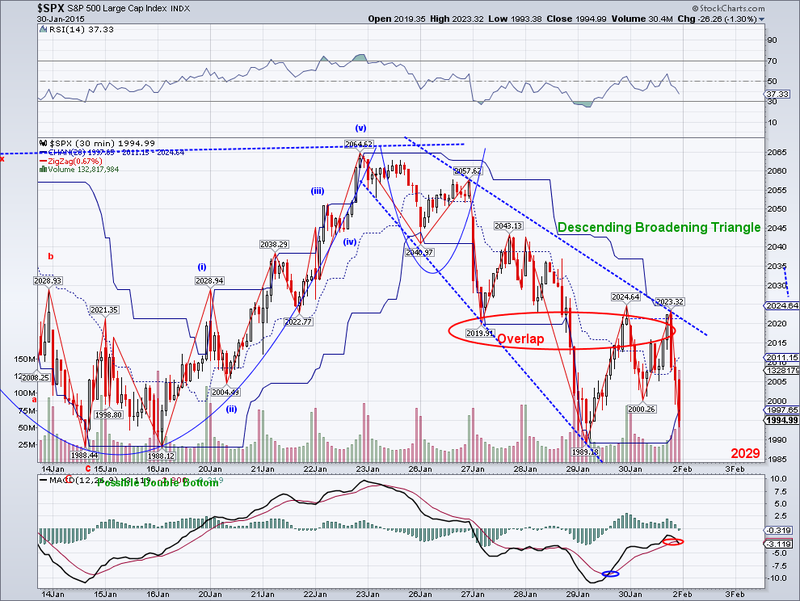 closing above the Trend Avg and possibly following a bullish nested 1-2 count. Given the ECB announcement will be on Thursday (before the market opens in the US), the bullish count looks like a strong possibility since QE would be bullish for equities. The TA is technically bullish already since the number is going slightly up, but I wanted to get 2 closes above it before confirming a turn. After 3 weeks of selling, the market is basically just 3% off all time highs and oscillators have been reset so no one should be surprised if there's a huge bull run for the next few weeks. The market closed right below the Trend Avg again and it has a potential to gap up or rally tomorrow in a bullish W3 that will bring the TA back to positive if the move is strong enough. It seems like traders are starting to price in QE in Europe, so we'll find out in a couple of days. Obviously, if the ECB disappoints (I don't see why they wouldn't implement QE under the circumstances) then the markets will find the excuse to re-visit the double bottom. But other than that, I don't really see much of an excuse for a deeper sell off at the moment. Some people were focused on China's 7% "crash" on Monday, but it seems like they did not notice the 70% rally since the low last year without much of a correction. I remain fully invested in China and I actually hope the SSEC will come down to 2600-2800 so I can exchange my H share holdings for A shares. I am betting the SSEC will eventually go into a bubble by trading close to multiples seen in 2007 (PE 45 vs PE 12 today). Most people have not yet fully grasped the size of the Chinese economy and the potential for its stock market to become the biggest in the world. In my opinion, it's just a matter of when and not if given current trends. The market bounced from the 1988 resistance level today and rallied the rest of the day, possibly in a double bottom to the most recent structure. If we see follow through buying next week that re-captures the Trend Average at 2023, there's a good chance the market will go back to bullish mode again. Oil seems to be confirming a bottom with today's rally over its Trend Avg and it's too bad I was stopped out yesterday during the retracement wave. If the rally in oil continues, the stock market will probably rally along as well and probably to a new all time high. Every time the market has been this oversold, we have seen new all time highs in the past 2+ years and most recently in December. I don't remember how many times its been already but I think this is the 7-8th time the market has reached this oversold level since Feb 2012. Obviously, at some point the market will roll over for a substantial correction. But personally, I don't see oil, copper, Greece or Switzerland stopping this uptrend. I think it will take "real" negative news to get momentum to the downside. The price action was highly volatile overnight with futures up by more than 20 points before reversing gains during the normal hours due to a surprise move by the Swiss to abandon their currency peg to the Euro. With this move, the Euro will probably challenge its all time low against the dollar at 1.05 if I remember correctly. Anyway, as far as the US market, things are still not looking very promising and I think a 200 DMA test needs to happen to really test the bulls. The count continues to be the same, so the market just needs to find its bottom. My oil position was looking great when I woke up early morning to set stops. 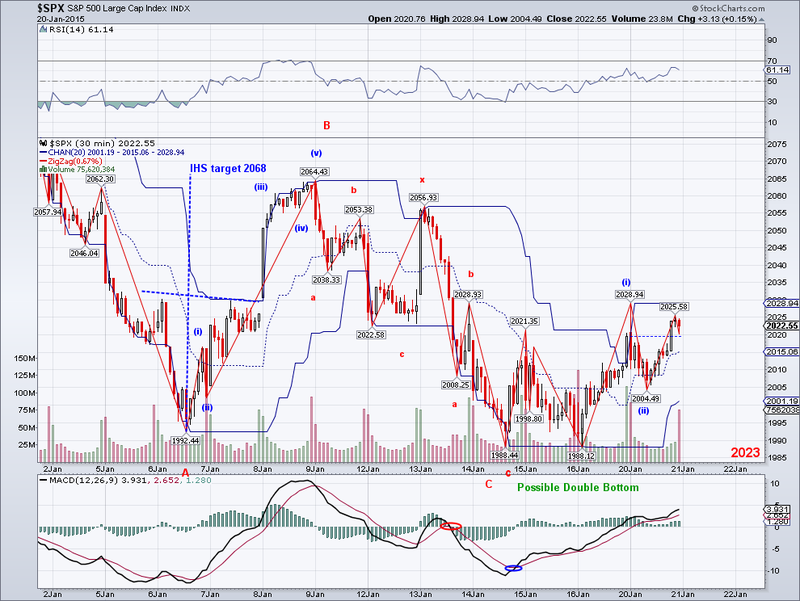 But by the time I woke up again my stops were already triggered, so I ended up even on the trade. Still, my longs in China are doing really good and I am almost there. Technically speaking, I just need China to go up another 20% to SSEC 4000 and its H shares in HK to reflect its true value and that will be it. And once that rally exhausts, maybe it will be time to give Brazil and Russia a shot as those markets are cheap and will likely get even cheaper. The market continued its downtrend today and it has now eliminated the potential bullish 1-2 count that had been in place since the market bounced from 1992. But given the invalidated bearish counts on the other indexes, I lean towards labeling this move from the 2093 high a zig zag. Which implies this is a correction and a new all time high will be coming once the market finds a bottom. If we ignore the other indexes, then this wave on the SP500 would a bearish W3 that would fit well with the Head and Shoulders targeting the 1880 area. But you just can't ignore the waves on the other markets. My position in oil is now back to green. So I expect to adjust my stop on a follow through rally to oil's Trend Average. 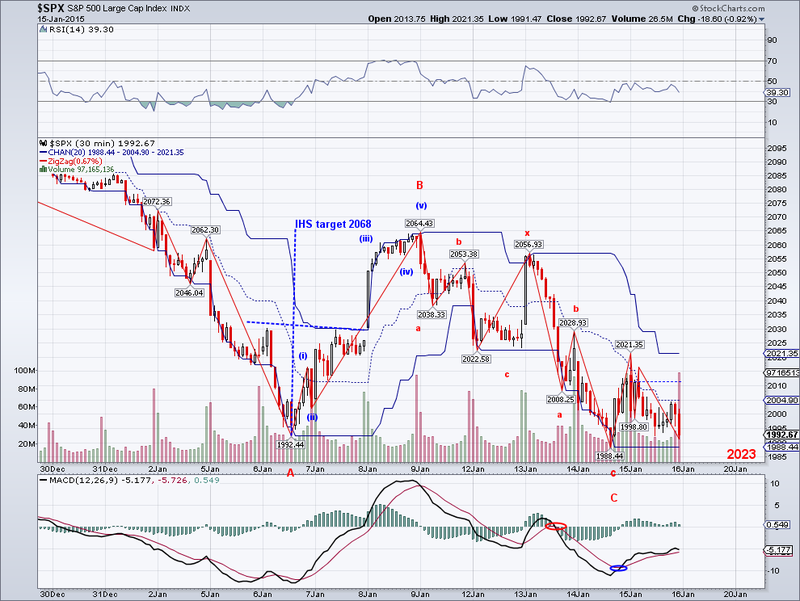 Today's wild price swings eliminated the bearish count I had posted yesterday. And while the short term trend and the intermediate trend are both bearish, the action today was actually on the bullish side despite the negative close. The SP500 looks like it could be setting itself up for a bearish W3, however all the major indexes (DJIA, COMP, RUT) had higher highs early in the morning and that eliminated the possibility of a 5 wave bearish count. And you just can't have a bearish W3 on one market while having something else on the others. The most likely intermediate term count at this point is this being a W2 correction as long as 1992 holds. Lastly, looking at the daily chart one could argue for a triangle, so I am not betting on the short side until the count is resolved. I remain long in China shares and oil. Obviously, nobody really knows how the supply problem will resolve itself in the short term, but the waves are calling for a bounce so hopefully oil will bounce to $50+ in the near term. Technically speaking, oil is now more oversold than at the 2009 low, so we could see a violent spike soon. The market failed to hold on to its 50 DMA and breached the 2029 level early morning, which now turns the Intermediate Trend to the bearish side. The next target for the bears is 1992 and a breach of that level will likely result in much lower lows. Still, the bulls still have the start of the earnings season (which I think will be positive, except for energy) and the sell off in oil should be about done. So we'll see if the bulls can turn the trend around the rest of this week, if not then down the market will go. Unfortunately for me, the pattern I was trading in oil ended up a bearish W2 so I got caught in today's bearish micro W3. My stop was hit before I could sell, so instead I ended up holding so I am hoping I will be right about a strong bounce in the next few days. 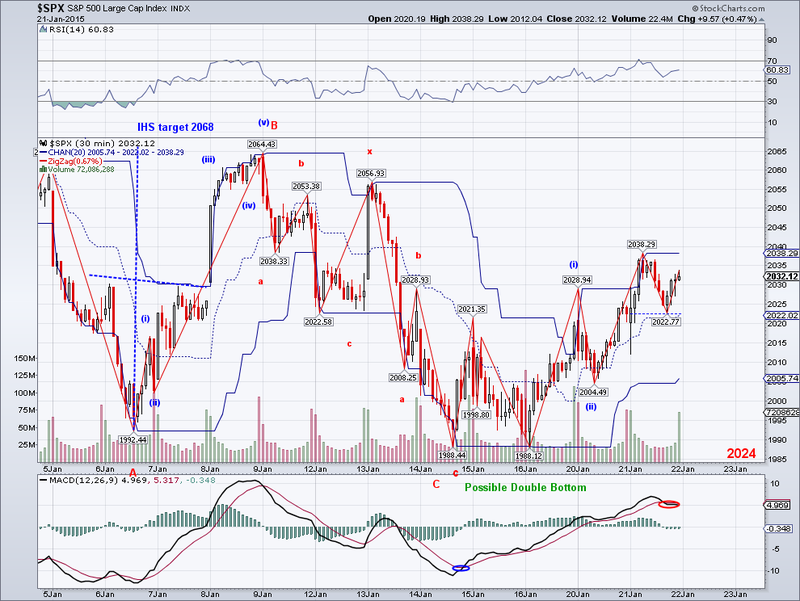 Also, if the market zig zags to a TA for a test, I might add shorts there to hedge my longs. 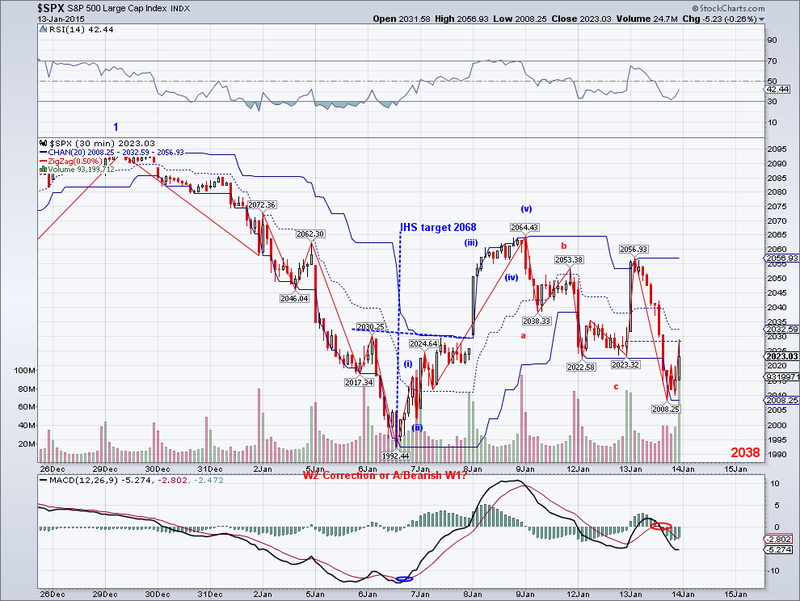 The market corrected today as expected and the 5 count is still viable as long as 2029.61 holds. 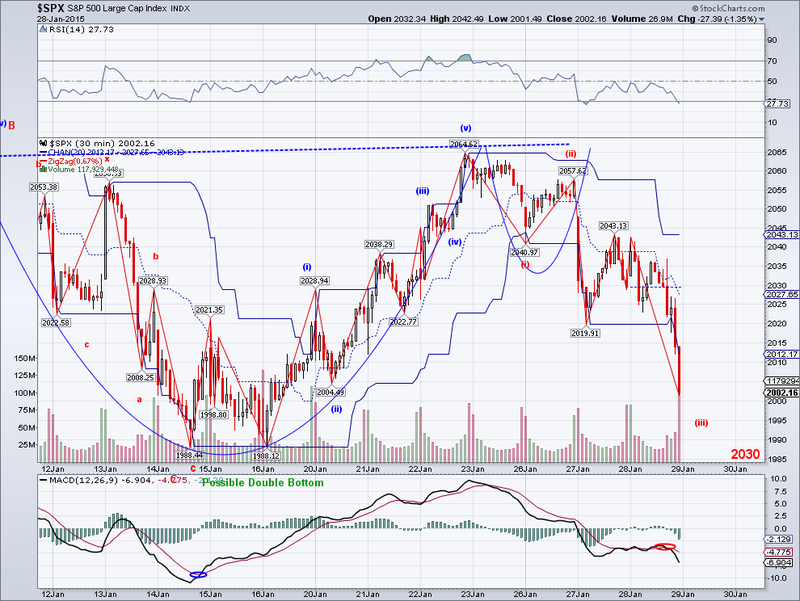 However, the correction ended closing below the Trend Average and there's a potential H&S that targets 1880. So we could see a decisive move next week that will solidify the direction of the short term trend. The fundamental picture should favor the bulls next week given the start of the earnings season and the possible end of the sell off in oil but we'll just have to wait and see. I went long today in oil now that the lower low I expected materialized and I see a potential bottoming pattern. My stop is today's low, so hopefully it's a bounce wave I am trading and not a bearish micro W2. As you all know, I believe these low prices will bring down supply since many oil companies should not be in business at this price. But one thing I have not mentioned is the likely rise in demand due to low prices. So market equilibrium might just be reached sooner than most people are anticipating. I am literally trading what I learned in my econ 101 class and the oil market could not be a better example of how the "invisible hand" of the market corrects markets in the long run. 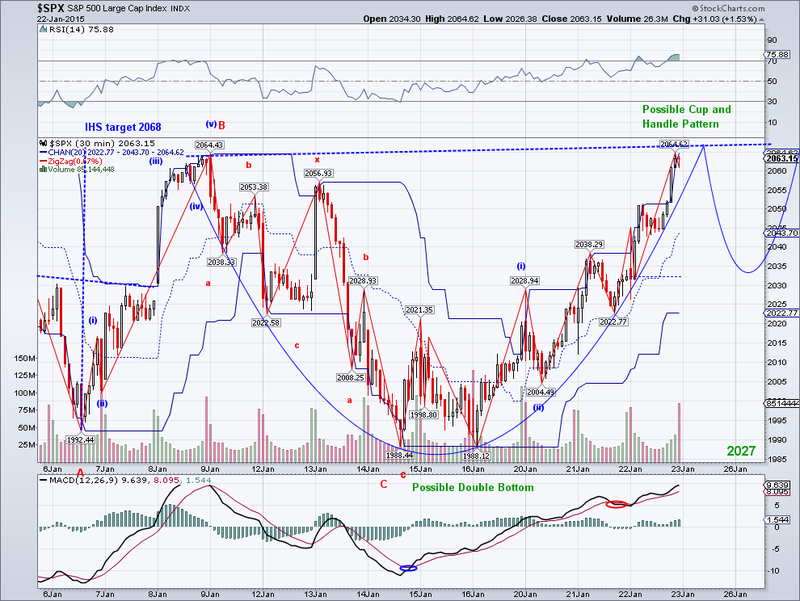 The market rallied as I expected and the IHS target was almost reached with today's high. Most importantly, the Trend Average was recaptured and this opens the possibility of a new challenge to the all time high at 2093. We still need to see more closes above the TA for the short term trend to turn bullish but usually whenever the TA is crossed with a W3, the trend usually favors the W3's direction. 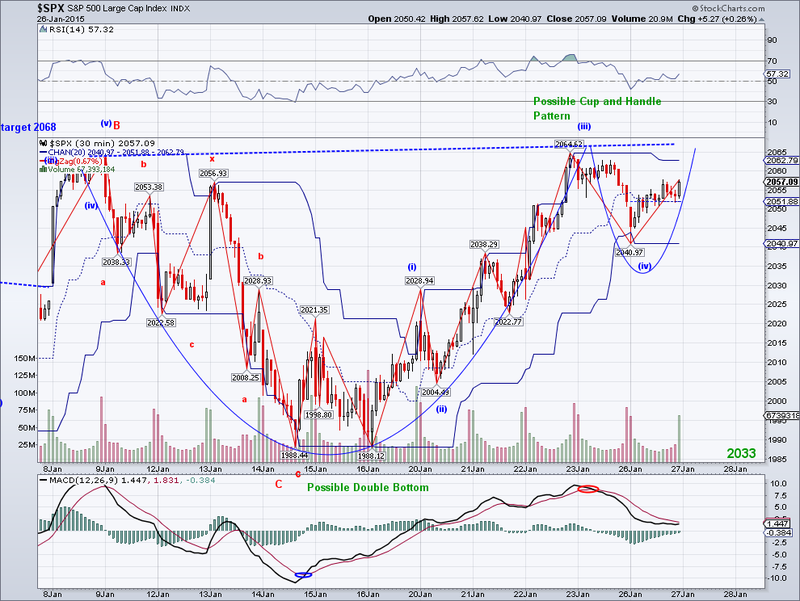 And like I said yesterday, earnings will come into focus while the sell off in oil is in its last stages. So we might just see another bull run in the next few weeks. I was planning to short to hedge if the market hesitated around the TA but I guess I'll just have to wait until the bulls truly exhaust themselves. I know many are hoping for a bigger correction to start and I am sure there will be one, but not until there is a solid reason to sell (Oil and Greece are just excuses to take profit imo). 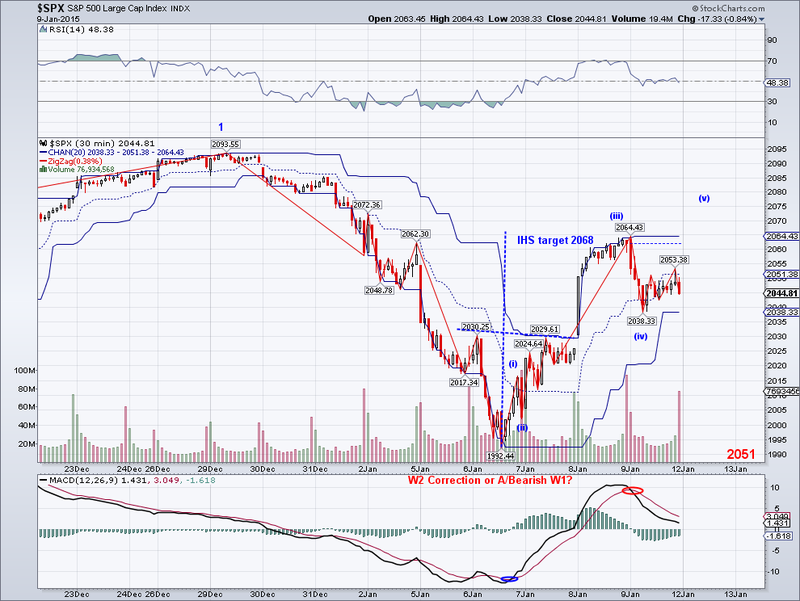 For now, all sell offs have just been corrections from overbought conditions. The market counter rallied substantially today as expected and we could get an idea of how the rest of the month will shape up in the next few sessions. I am expecting the market to test the 50 DMA at 2041 but I also seen an IHS and a potential 5 wave micro count that can reach 2060-70. 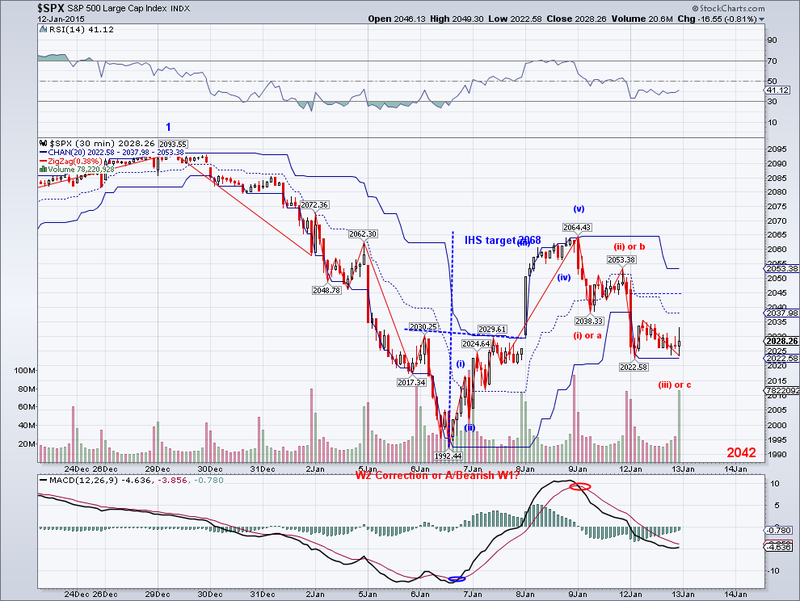 If the market fails to recapture the TA convincingly, then lower lows are likely. But if we get a strong W3 that closes comfortably above 2053, then there's a good chance we will be looking a new all time highs before the month is over. The market is very focused on oil at the moment and it seems to me like there could still be one more smaller bearish wave down if the bottom so far proves to be a micro W4. But if the bottom is in, then we should see a strong counter rally in oil which will be used as an excuse to take on all time highs in stocks. Also, next week people will be focused on earnings and they should come ahead of estimates. The market continued to sell off today to make a lower low at 1992, coming close to the previous significant low of 1972. Which makes the bullish count still viable but getting close to being invalidated if we see another strong bearish wave. The market is already very oversold and there are enough micro waves to call the structure complete. So a bullish wave should come very soon that will give us a better idea of what the market wants to do in the next few weeks. The excuse for the sell off continues to be oil but like I said yesterday, chances are a temporary or even long term bottom will be found soon. OPEC (Saudi Arabia in particular) continues to play chicken with non-OPEC producers and at some point someone will start cutting production. And make no mistake that this is a supply driven sell off and NOT demand driven, once they have supply cuts figured out oil will shoot back up. I read that just 1 million b/p/d in the market moves oil prices $20, so oil at $70-80 might be back before we know it. The market sold off today and the count has now changed to reflect new possibilities. The wave from 1972-2093 was a very strong wave without any substantial corrections, which favor this sell off wave being a W2. 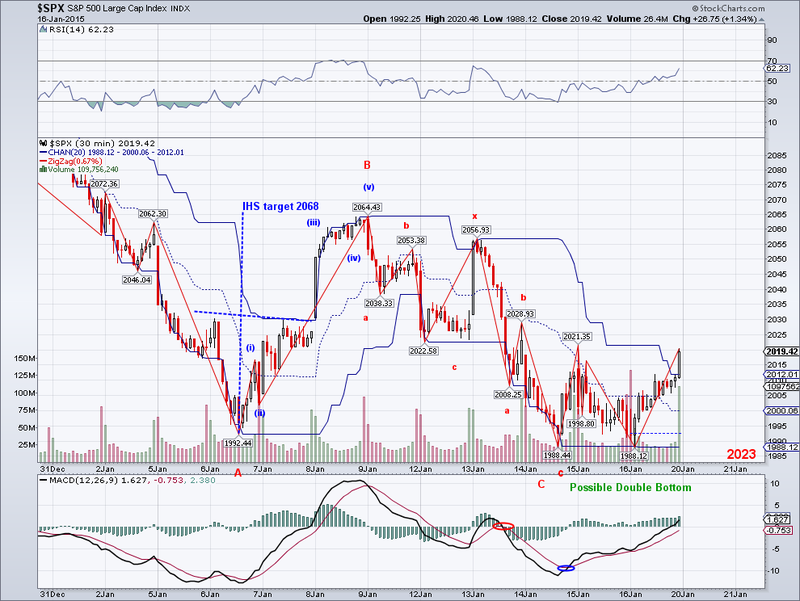 But if we label 2093 as an intermediate top, then this bearish wave could be an A or a bearish W1. The key level to watch while the TA is negative is 1972, if that level is breached then the market will go into a much bigger correction. Also, the bullish MACD crossover from couple of weeks ago was reversed and bulls need to regain the 50 DMA and the TA to recover its bullish stance. Fundamentally speaking, the sell off was caused because of the slide in oil which traded today in the range I was targeting for the triangle breakdown of $48-50. So oil looks like it is in its final wave before a bottom and once a floor is found, bulls might use stable or rising oil to charge again. And don't forget, all this extra cash generated by savings in gas will be translating into earnings. A headline that was missed today was the sales from automakers, which had a very strong December and the best year since 2006. Any business that benefits from discretionary spending will be reporting a strong Q4 starting next week. Lastly, China (who probably benefits the most from low oil prices) rallied 3.6% last night so bulls might just be setting up a bear trap again. I am holding my long positions (which fortunately are China related) and will consider hedging at a test of the TA just in case or maybe long oil if I see a finished 5 wave count from the triangle. Welcome 2015! I can't believe it's been now almost 6 years since the 666 low in March 2009. A lot has happened since then, but at the same time it seems like all these years just flew by. Economically speaking, things do look a lot better now than in 2009 but obviously we still need to see the complete outcome of all the QEs. Since I am a natural optimist, I hope things will be even better 6 years from now in 2021. 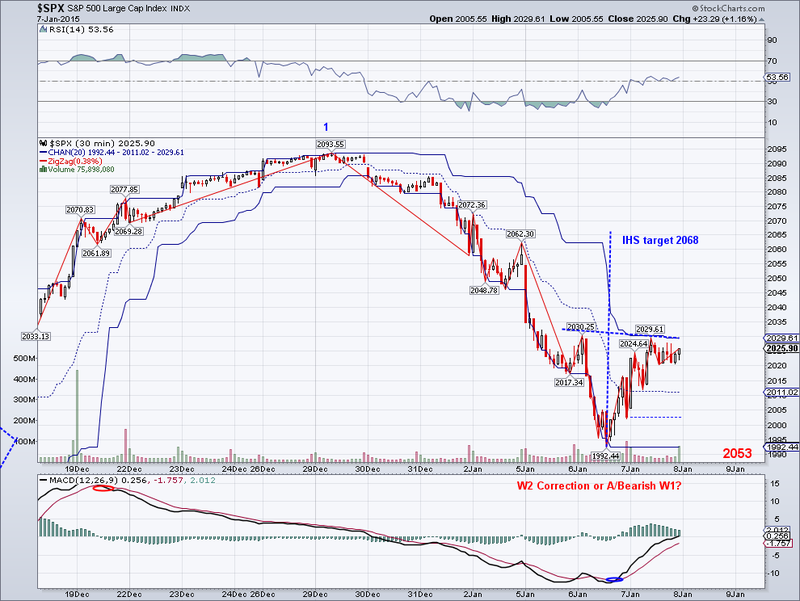 Anyway, the market retreated to a lower low today in what looks like an over extended micro W4. I still prefer to label it a W4 because of the way oscillators have behaved. 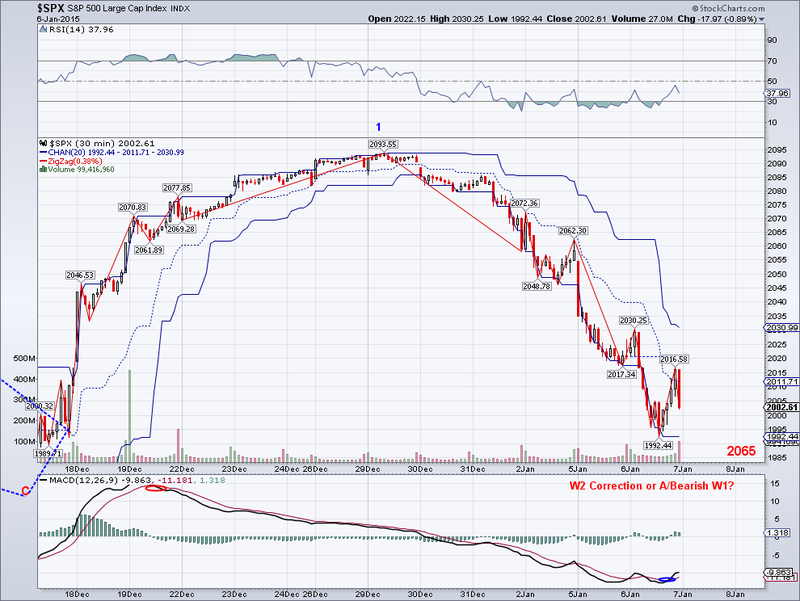 For example, the 30 min MACD shows a classic W4 reset (the longest reset I've even seen). So if there is a 5th wave coming, it must come on Monday or else there is something else in the works. There's a small IHS targeting 2065 more or less and if the bounce wave from 2046-56 is a micro W1 then 5 waves project to resistance at 2072. Last but not least, the market closed for the second time under the Trend Average and it must re-capture it early next week or else it will turn bearish. Which would force me to change the labels to a bearish option.. I hope not since I want to short to hedge at higher prices, but I guess we'll find out soon.